Three-year-old Gianna Masciantonio and her mom, Kristen, enjoy the Designer Bag Bingo event Nov. 12 at St. Cyril Parish, Jamison. The fundraiser helped support families with children who, like Gianna, are battling serious diseases. When little Gianna Grace Masciantonio was kissed by Pope Francis during his visit to Philadelphia in September 2015, she had just turned 1 – a birthday her parents had feared she wouldn’t live to see. Now the 3-year-old child who was born with a large benign tumor on her brain stem was busy coloring and checking out the kitchen cabinets in St. Cyril Parish’s social hall in Jamison where hundreds of well-wishers — mostly women — gathered Sunday, Nov. 12 for a Designer Bag Bingo event designed to raise funds for other children battling brain tumors and rare diseases. The event raised $30,000 through ticket sales to the bingo game with designer handbags as prizes and the raffling of 86 goodie baskets, sports memorabilia and a football jersey signed by Eagles quarterback Carson Wentz. The funds will go to the For the Love of Grace Foundation that Gianna’s parents, Joe and Kristen Masciantonio of Warrington, founded in their daughter’s honor to support research and patient needs at Children’s Hospital of Philadelphia. Kristen hopes to make the bingo an annual happening. “Today we remember and honor every child enduring this battle,” she wrote in a brochure for the event. Many of the Masciantonios’ relatives and friends from Western Pennsylvania were in attendance, as were the families of children who are fighting or have succumbed to tumors, as well as hundreds of parishioners from St. Cyril’s. More than 300 people filled the banquet hall. 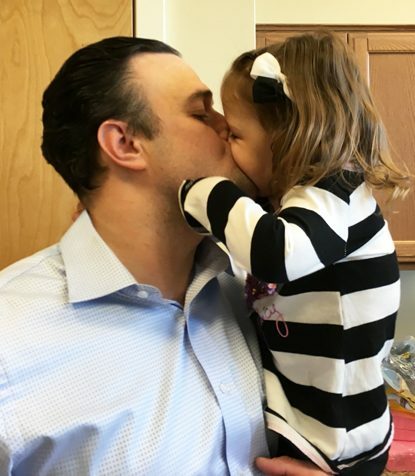 Joe Masciantonio gives his daughter, Gianna, a big kiss during the Designer Bag Bingo fundraiser Sunday, Nov. 12 at St. Cyril of Jerusalem Parish in Jamison. Alexis DeLuca, owner of the Novel Baker in Ivyland, provided an entire sweet table filled with a tiered cake, cookies, cupcakes and other confections laced with pink trimming in honor of Gianna. “She stayed up all night,” Kristen said of the baker, adding that DeLuca and others in St. Cyril’s congregation have prayed each week for Gianna at Masses for the past few years. “We’ve been praying for her since she was born — every weekend in the Prayer of the Faithful at all the Masses,” said Cassie Dunn, business manager at the parish. After failing a hearing test as a newborn, Gianna was diagnosed with a large tumor on her brain stem, which controls vital bodily functions. When the Masciantonios were told the tumor was inoperable and their baby wouldn’t survive infancy, they sought advice and second opinions from doctors around the country. On Christmas Eve, three months after her birth — as Gianna was being dressed to play Baby Jesus in a Christmas Nativity scene — a doctor at the Memorial Sloan Kettering Cancer Center in New York called the family to say he didn’t think the tumor was cancerous. Two months later, after a biopsy could be performed, doctors determined that the tumor was the result of a rare juvenile blood disorder that caused her body to form too many white blood cells that massed into the tumor. Not only was the disease rare, but where her tumor was located in her brain made her condition even rarer. Gianna’s parents prayed and visited the Shrine to St. Gianna, the patroness of mothers and babies, at Nativity of Our Lord Church in Warminster. Kristen also had a dream that the baby would be kissed by the pope. Then they heard Pope Francis was coming to Philadelphia. The couple turned to a friend in the FBI to see if the baby could be blessed by the pontiff, but it wasn’t until Saturday, Sept. 26, 2015 during his visit that they got a call to come downtown. 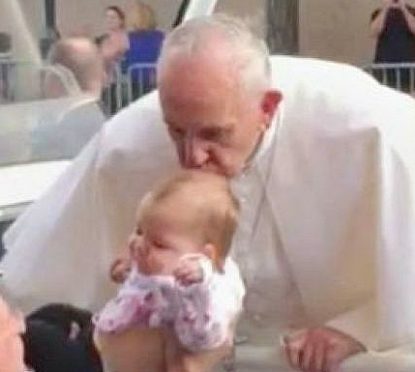 Despite their misgivings about taking their ill baby into the crowded city, they went that day and as the pope’s motorcade traveled along a street filled with spectators, the family and FBI agents held the baby up as the pontiff looked their way. Members of his Swiss Guard security detail brought Gianna to Pope Francis who kissed her. The story and photo went viral around the globe. Within two months of the papal kiss, the tumor had shrunk on scans so that it was barely visible. But Gianna still needed chemotherapy and multiple operations at CHOP because of the effects of the tumor pressing on her brain stem and leaving the left side of her body weak. Now the toddler can walk, talk and play with her 6-year-old brother, Dominic, though she still has tonal problems on her left side which is more rigid than her right. 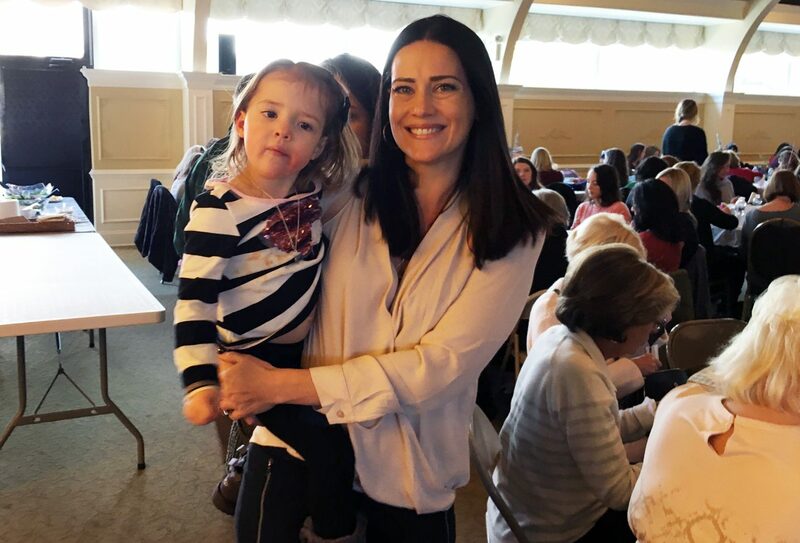 Kristen Masciantonio said she and her husband were amazed at the turnout for the bingo and all the support it generated not only for their daughter but other patients whose families they met at CHOP. Several photos on a wall overlooking the raffle gifts showed the other patients. “I’m Mikayla,” said an 11-year-old girl, brightly pointing to her photo on the wall that identified her as Mikayla Hornick, a “medullablastoma warrior.” She is now in remission from this malignant brain and spine tumor. Mikayla’s mom, Heidi Tarshis of Warwick, described how her family and the Masciantonios knew each other even before they ended up in adjoining rooms at CHOP while their children were being treated. organizing the bingo that attracted dozens of sponsors. 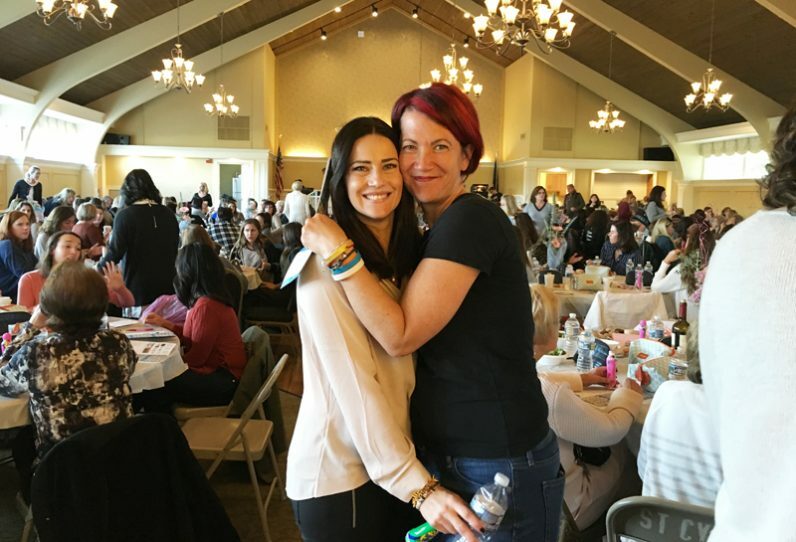 Kristen and other women in St. Cyril Parish also meet each Tuesday to pray the rosary for children and others in need of prayers via a conference call line with friends and family around the country. About 50 to 100 people join in. Kristen Masciantonio of Warrington (left), who organized the bag bingo fundraiser, gets a hug from Kira Liples of Doylestown, whose son Dominic, 8, died of a brain tumor in December 2016. Miracles do happen! Beautiful story. Thank you. Great to hear. These kids are special and we should do all we can to help them live long and successful lives.